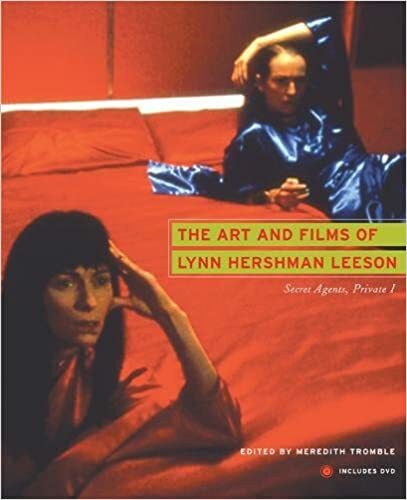 The Art and Films of Lynn Hershman Leeson – loudlatinlaughing – Euge! Euge! The more I learn about Lynn Hershman’s work, the more I miss a San Francisco teeming with artists, writers, weirdos. I recently remembered Hershman after encountering a writeup in a July 1977 Art in America article that described her 1976 Bonwit Teller window displays—a mannequin’s hand bursts through the window in one, in another a crime of passion is on display (one mannequin shoots another). This book is a collection of her major works and films, showing you at a glance how much her work investigates how people interact with technology, her interest in sociology, feminism, capitalism. As a young woman artist, she wrote art reviews and essays under 3 pseudonyms, gaining columns in the local paper and as an editor at Artweek, writing for national art magazines and European art journals. She wrote about the work of Lynn Hershman and took these reviews in to galleries where she was able to get her first exhibitions and real evaluations. Several of her pieces took place in SF, like Roberta Breitmore, the Dante Hotel, and Two Stories Building (images of fire projected onto windows of a downtown building along with fog machine billowing smoke, dancers leaping out of windows. A passerby actually called the fire department who showed up and aimed hoses at the projected images of fire). Another window display, something that would never get done today? Philadelphia location of Wanamaker’s department store, Hershman showed an image of woman luxuriating contrasted with a darker image of someone who couldn’t quite reach the credit card out of his grasp (Non Credited Americans, 1981), slide show of elderly, minorities, and women who had been denied credit, endless audiotape loop of interviews of unsuccessful attempts to get credit.